Skiddaw situated just north of Keswick is the sixth highest mountain in the Lake District and standing at 931 m (3,054 ft) it dominates the skyline in this part of the northern lakes. Skiddaw has a north-south running ridge of about half a mile long with steep slopes to the east and west. Its ridge continues northwards over Broad End to Bakestall and at the southern end it throws out ridges to the east and west. To the south east are Little Man, Lonscale Fell and Latrigg beyond these are the Blencathra group. To the south west the ridge curves round to run north above Bassenthwaite Lake giving Skiddaw an outer wall comprising of Carl Side, Long Side and Ullock Pike, collectively known as Longside Edge. Down below between Skiddaw and Longside Edge is the quiet valleys of Southerndale and Barkbethdale. The last member of the Skiddaw group is Dodd, a satellite of Carl Side. Skiddaw’s summit ridge has four tops known as North Top, High Mann (the Summit) Middle Top and South Top all of which are marked by cairns. There are also a number of wind shelters. The views are absolutely amazing from the whole of the Lakeland fells, a part of Snowdonia, the Yorkshire Dales and the Forest of Bowland. The Isle of Man is visible some 60 miles away, on clear days the Mourne Mountains 120 miles away, the coastal plain and the distant Solway Firth backed by the hills of Galloway and Goat Fell on Arran 105 miles away can also be seen. Many routes of ascents to Skiddaw have been devised but the most popular route starts from Keswick and 200m of ascent can be saved by driving to the top of Gale Road and starting the walk from the car park just behind the summit of Latrigg. Latrigg at 368m (1207ft) is one of the lowest fells in the Lake District but very popular due to its location overlooking Keswick and its views down the valley of Borrowdale from the summit. Little Man is situated 4 km north of Keswick and is a subsidiary summit of its parent fell, Skiddaw. 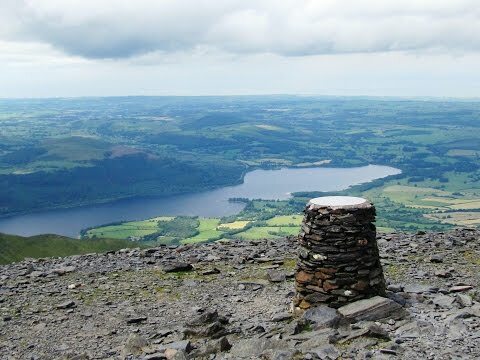 Little Man at a height of 865m (2,837ft) lies 1.5 km south east of Skiddaw’s summit and has its own subsidiary top known as Lesser Man at 815m which lies half a kilometre to the south east of its main summit. Lesser Man is marked by a cairn of rocks and old fence posts and half a kilometre to the south east of this stands Jenkin Hill at 735 m which is regarded as an outlier of Little Man. To the north and east Little Man is connected to the Skiddaw massif and to the south and west it falls steeply away towards the River Derwent. Little Man, due to its convex southern slopes, has one of the best panorama viewpoints in the National Park far better than Skiddaw itself. Carl Side at 716m (2,349ft) is situated north west of Keswick and also part of the Skiddaw group. Carl Side sits at the southern end of Longside Edge with the grey flanks of Skiddaw and Little Man looming above. A small cairn marks its summit which is a mainly grassy plateau smoothly sloping away on all sides except to the north where some shattered crags look down on Southerndale. The views southwards towards Derwent Water and the fells surrounding the water and beyond are wonderful. From the summit a system of ridges descends southwards towards Millbeck. The main spur runs straight for a mile the first half being of a gentler gradient taking in the large area of White Stones at around 1,600 feet then falls very steeply to the bottom of the valley. On the eastern side is Carlsleddam a steep sided spur and the crags of Doups. On the western side is Dodd, a fell on Forestry Commission land that is mainly wooded. Carl Side is often ascended via Ullock Pike and Long Side then continued to Skiddaw but Millbeck provides the nearest starting point. Keswick is a market town now mainly tourist orientated due to the many thousands of tourists visiting every year and the majority of side streets are abundant with B&B’s. Derwent Water is about 3 miles long by 1 mile wide and sits on the south edge of Keswick town and is fed and drained by the River Derwent. The river also connects Derwent Water to Bassenthwaite Lake which is north of Keswick. Bassenthwaite Lake about 4 miles long and three quarters of a mile wide is one of the largest but very shallow water bodies in the Lake District and is the only body of water in the Lake District to be defined as a lake and named as a lake all the others being waters, mere’s or tarns. At the end of car park we turn left through the gate and follow the wall on our left. The wall becomes a fence and we follow it as it bears left. We pass a memorial to two shepherds and continue to follow the zigzag path steeply uphill. When we come to a fence we turn left uphill then at the cairn we turn right and follow the path to the summit of Little Man. From the top we head forwards slightly right downhill. At the fence we bear left uphill and keep following the path as it turns right towards the trig point on the summit of Skiddaw. From the top we retrace our steps for a few hundred yards to a cairn on our right we turn right here very steeply downhill towards two small ponds. The path is stony with shale so care must be taken. At the ponds the path splits into two we take the left path uphill to the cairn on the summit of Carl Side. From the top we start to go downhill very steep in places. We walk to the left hand side of the White Stones and keep heading downhill through a wall. We keep following the path downhill until we arrive at a house and some trees at Millbeck. We go through a gate next to the trees and follow the narrow path. At the end we turn right and then turn left at the road. We follow the road bearing left at the y-junction. Now with the houses of Applethwaite on our right we keep heading forwards over the bridge at a gill. At the next y-junction with a hotel on the left we bear left signposted Skiddaw. We now just follow this road uphill back to the car park. This is a hard walk on well defined gravel paths and tracks with steep inclines and declines. The descent down from Skiddaw to Carl Side is very steep on loose shale so please take care. Elevation: Approx lowest point 113.11m (371.1ft) approx highest point 927.90m (3044.3ft) approx total ascent 856.21m (2809ft). Approx 7 miles allow 4 – 5 hours using OS Explorer Map OL4, The English Lakes North-western area. Start point: Car park at the end of Gale Road just below Latrigg summit. Skiddaw is north of Keswick in the north-western fells of the Lake District, Cumbria. Travelling from the east on the A66 after passing the Keswick turn off continue to the roundabout and turn right onto the A591 then turn immediate right again onto a minor road towards Ormathwaite and Applethwaite. Just past Ormathwaite take the next very sharp right turn (Gale Road) going uphill and continue to the car park at the end of the road. Parking: free parking at the end of Gale Road and also some verge parking just below Latrigg summit. There are no public toilets or refreshments. The nearest facilities are at Keswick where there are public toilets and ample shops, cafes, pubs and restaurants.